Pumpkin ice cream and Eggnog Lattes, it must be the Holiday season. Shockingly to anyone who's ever been around me during the holidays, I'm getting Christmassy. I actually had on the radio station that plays Christmas carols merrily singing along with it last night, without even so much as a mini rant about it not even being Thanksgiving yet for pity's sake. You're still not going to find me shopping Friday. I'd rather be boiled in oil. Here's the finished * Hug for Snickers scarf, draped on the cat tree, appropriately enough, since Hezekiah refused to pose with it and every picture I took of me wearing it are never going to see the light of day. Ta da! 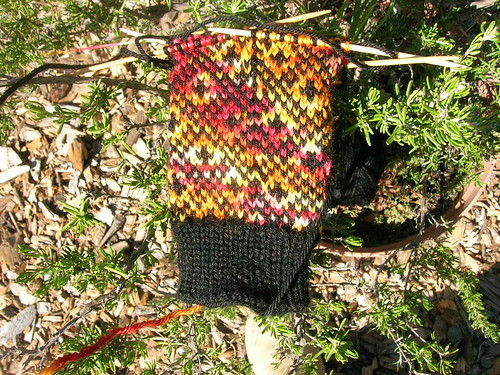 The finished Endpaper Mitts. Can you tell one is smaller than the other? It's not so much smaller I can't wear them, in fact, the smaller one feels kind of fabulous on my right hand while knitting/mousing. The Selbuvotter Mittens that in no way can I knit in public, or with anyone speaking to me, with the TV on, imperfect lighting....I changed the bottom chart because I didn't like how the original looked, not that you can tell which one I'm knitting. There has got to be a way of putting these in columns. It'd be nice to have the picture match the caption for a change. As a [television viewer] public service announcement, here's where you can find out how many episodes are left on your shows. Mind you, they're all at least one down. Take a good look at that deck. That's why you're not supposed to use indoor paint on an outdoor surface. Men. 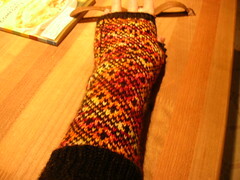 I finished the Endpaper Mitts! Once I weave in the ends, I'll post a pic. So pretty. I was a little panicked about having enough yarn, and if I'd made two medium sized ones, it would have been close, but enough. As it turns out, the small was really the right size for me. Mind you, I have one medium and one small but it's not that glaring a difference and definitely not enough to redo. They're so pretty! Remind me. Use smaller needles when working ribbing. Why is that so impossible for me to get through my skull? The Hugs for Snickers scarf is getting a wee bit longer, I've knit nothing on the Curve of Pursuit, Mary Tudor, or Lace Edged Elegance aka Golden Gate, but hey. Deadline today. It's been all about nothing, nothing nothing and then WORK! No pictures today either, it's all panic and then I'm out of here for the week. I wish I'd gotten a picture of the sight I saw yesterday on the way home from work! I was sitting at a stoplight in a half commercial/half apartment area noticing your average semi gangster big pants long t-shirt looking guy crossing the street in front of me taking a long look at a nondescript down-at-the-heels looking guy walking on the sidewalk. The guy looked......well, nondescript. I'd say hard up, but that seems to be the fashion. (I'm not crazy about the big pants long T-shirt look either.) I mean, clearly nothing that Long T-shirt would register normally. So I take a long look at nondescript down-at-the-heels guy and think that maybe he's holding something. A puppy? Is the guy a creepy predator? A stack of letters? Is he a misunderstood soul? It finally dawns on me that yeah, he's holding something and that something is wrapped around his neck too. Something like this. And naturally, not only do I not have my camera with me, by the time I remember my iPhone has a camera, the light is green and the traffic is making me move and I miss my shot. Bummer, but hopefully I won't see that again. Yes. I admit it, I'm afraid of snakes. I'm afraid of small harmless garter snakes (suuuuure they are. This is rattlenake country), so imagine my fear of big huge ginormous maneating snakes. TV TALK: I hope everyone is watching Brothers & Sisters Sunday nights. It's a little suspect that every single one of them is having relationship problems (well, not Kitty and Rob Lowe). Oh and (WARNING: SPOILER discussion of last night's show) what kind of plan is it to save your marriage to go home and live with your parents, particularly when your father clearly thinks your husband is not the best you can do? Taking your one brand new surviving twin with you. It did crack me up when Sloan offered to spot him three strokes if he wrapped the 9 Iron around his father in law's neck. Tonight: Chuck, Heroes and Journeyman. Heroes didn't even get a "what's happpening" blurb in our "TV Guide". For the record, I hate the new TV "Guides". Five different grids for different time periods, most of the shows labeled "various" - like I need a "guide" to tell me there'll be various programs on TV - it's pretty much a given. Grrr. On Journeyman, it looks like Dan gets braced by both Katie and Maybe Not Dead Fiancee tonight. (Have you noticed I'm having the worst time remembering names this season?) Funny, the one thing that almost put me off the show completely is what I'm finding the most compelling. No Bones or House tomorrow night so it's all about NCIS, The Reaper and Damages. FX is running a marathon of Damages on Saturday- 12 episodes if anyone wants to catch up. The Women's Murder Club last Friday night was a little disappointing. In fact, I watched Friday Night Lights which SHHHH! is not half bad. Naturally last week was the lowest ratings its ever had. Joy. Thursday night I have got to watch Viva Laughlin (CBS). It's up against Law & Order Criminal Intent (USA) at 10pm, but I have a feeling it's not going to be a conflict for long but I'll probably love the dumb thing. Knit Bits: I'm having massive desires to cast on the Spanish Knight and Medieval Tapestry (both out of Jade Starmore's A Collector's Item book.) Naturally I have nothing in my stash. Also? I have WIP's! WIP's that are reasonably close to being done if I'd work on them. One Long Winded Post. Again. Bellamoden's hand dyed yarn (Eunny's Endpaper Mitts pattern). That's not really a ladder up the middle, it's actually the purled side seam. Weird angle. Here is weird lighting to offset the other picture. Gah. Meme stolen from Book Chase, originated w/Kimbooktu. 1. Hardcover or paperback, and why? Both. Hardback to keep, paperback to lug around. 2. If I were to own a book shop, I would call it... Go Away, I'm Trying to Read. Own a bookshop? Then I'd have to do bookkeeping and ordering and keeping customers happy......although I have always wanted to own a combo bookstore, bar and yarn shop. Signifying nothing. MacBeth. I love MacBeth. Eminently quotable. 4. The author (alive or deceased) I would love to have lunch with would be...Alice Starmore. No wait. Wrong author. Alison Weir. 5. If I was going to a deserted island and could only bring one book, except for the SAS survival guide, it would be...the biggest anthology I could find. 6. I would love someone to invent a bookish gadget that...would hold my book open, turn the page, keep the right amount of light on it - basically I need a robot slave. 7. The smell of an old book reminds me of...Heaven. I mean used bookstores. Same thing. 8. If I could be the lead character in a book (mention the title), it would be...One book? So limiting. I'm the lead character in ALL of them. I think that's why reading is so addicting. 9. The most overestimated book of all times is...The Da Vinci Code? Jonathan Livingston Seagull? Anything overhyped. 10. I hate it when a book...is about serial killers targeting woman (a current favorite plotline it seems like) or gets really sappy or preachy. I'm supposed to tag five other bloggers for this meme but it has really made the rounds, hasn't it? 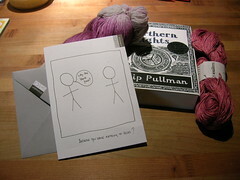 I tag Elspeth anyway, Alum Creek, hand eye crafts, Knitting in the North and On the Needles. Little Ice Age by Brian Fagan. Interesting and informative. Oddly enough, data they didn't expect to be able to confirm for decades in 2000 (when the book was written) seems to be cold irrefutable fact nowadays. Not that I doubt the possibility of global warming or another ice age but the certainty it's being presented in. Thunderbird Falls and Coyote Dreams by CE Murphy. Books Two & Three of Joanne Walker aka Siobhan Walkingstick. (reviewed by Stumbling Over Chaos). Equally shockingly, the Non Fiction Five Challenge that Joy hosted ended yesterday and I actually read more than the five the challenge......uh, challenged. A New World: An Epic of Colonial America From the Founding of Jamestown to the Fall of Quebec by Arthur Quinn. - fascinating look at often forgotten historical moments. The Acadians for one. Assassination Vacation by Sarah Vowell - quirky obsession with dead presidents. Great travel guide. The Unicorn's Secret: Murder in the Age of Aquarius by Steven Levy - the 60's had its share of charismatic wingnuts. The story of Ira Einhorn. Richard the Third by Paul Murral Kendall - the version of what I prefer the life of Richard III to have been. The Princes in the Tower by Alison Weir - more likely. How to Read a Novel by John Sutherland - the man loves his novels. He made me appreciate them again, I'd been reading non fiction fairly steadily for some time. What was the best book you read in this challenge? The best? I enjoyed all of them, although Alison Weir's more up to date scholarship on Richard III dashed my Richard III high from PMK's book. What book could you have done without? Which one do I regret reading? None of them. Which one did I need to go on? None of them. Did you try out a new author? Yes. If so, which one, and will you be reading that author again? All but Alison Weir were new to me and sure, I'd read them again. Steven Levy has an interesting looking book out about hackers on my TBR shelves now. If there were books you didn't finish, tell us why. Oh, I didn't even list these. Did you run out of time? Realize those books weren't worth it? Put them in the Some Day stack, most likely. Did you come across a book or two on other participants' lists that you're planning to add to your own to-be-read pile? Which ones? Always. And no idea. What did you learn -- about anything -- through this challenge? I can finish! If only that applied to my knitting too. What was the best part of the this challenge? But, most importantly, what you should watch on TV. Chuck at 8pm but mostly for Adam Baldwin, of the late lamented Firefly. Journeyman at 10pm but it might be the last week. Oh jeez, what's on the rest of the week? I'm still not up on the schedule. In knitterly pursuits, I'm not quite done with the Endpaper Mitts, I'm ripping along on the Curve of Pursuit blanket - I love this pattern, I'm not sure why I waited a year to cast it on, the Mountain Stream scarf is coming along (although I did have a snafu at the border naturally) and possibly I cast on a pair of Latvian mittens. Did I finish anything? Don't be absurd. Very cool, no? I've been wanting to read Philip Pullman for awhile now, I keep hearing such good things about his books. And voila! In my library at my fingertips. And apparently it's some kind of reverse birthday gift - Happy Birthday, Susoolu! Okay, now I know that there is suffering and anguish (too much) and there is no world peace and there are far, far more important things in this world, but everyone just wish "FINISH A FRAKKING KNIT PROJECT" thoughts at me anyway, willya? It's my only hope.